Hey folks today we will be reviewing the MiBoxer C2-6000 this is the bigger brother in the C2 line up. The C2-6000 lays waste to other quick chargers on the market with charging capabilities of 3amp per slot with a total of 2 slots. I will have the C4-12 review coming up soon! As per usual the C2-6000 was sent to me for review by MiBoxer I will leave a none affiliate link here. I forgot to link my last review sorry! I will update that now lol. Random thought! With the C2-6000 we can say its only a 2 slots charger right? But it is equivalent to a 6 slot 1amp charger. Just a random thought there! Actually makes this charger a great option if you have a limited space seeing as its a fairly small charger! The MiBoxer C2-6000 is built like the rest of the MiBoxer range with a solid build quality and a great design. The C2-6000 is built like a brick no squeak or creaks from this charger. Big plus for me seeing as some times people or pets get caught up in cords and the charger may fall. The LCD screen is very clear and is very well back lite the letters and numbers are very clear and precise. If any thing the Back lite may be a little to bright for some people is that even a thing? 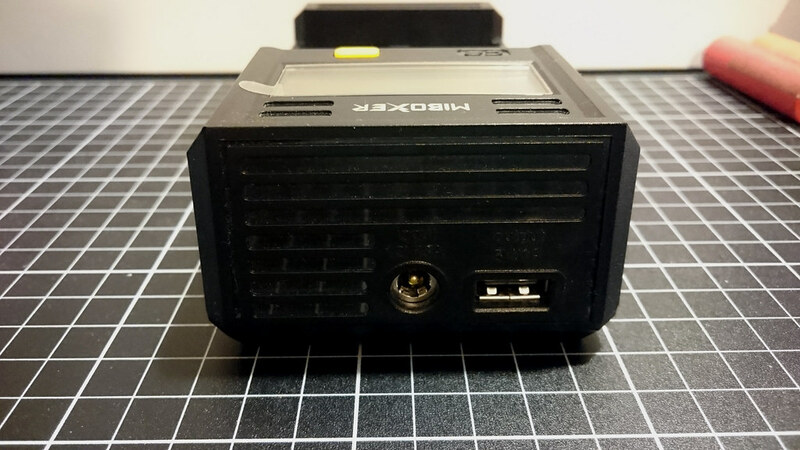 Al thought the MiBoxer C2-6000 is a fast charger it manages to stay cool by having vents on the back and by using an external AC-DC adapter. The C2-6000 is a mix between the C2-3000/4000 in a design sense its good that all 3 chargers are shaped different. 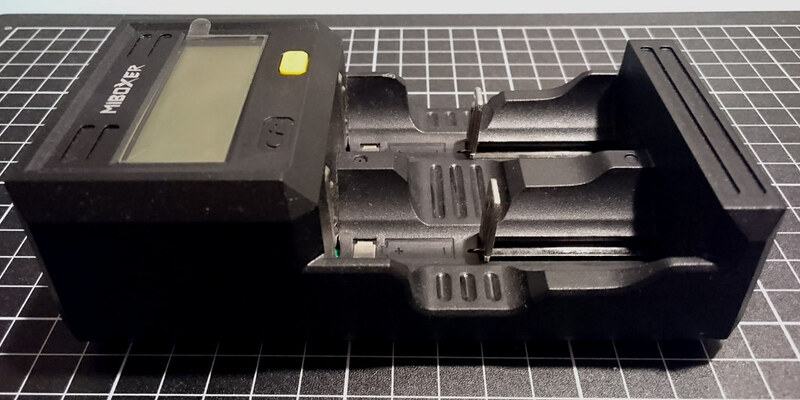 The C2-6000 keeps all the grooves that are found on the C2-4000 this helps for easy operation and easy battery placement and removal. 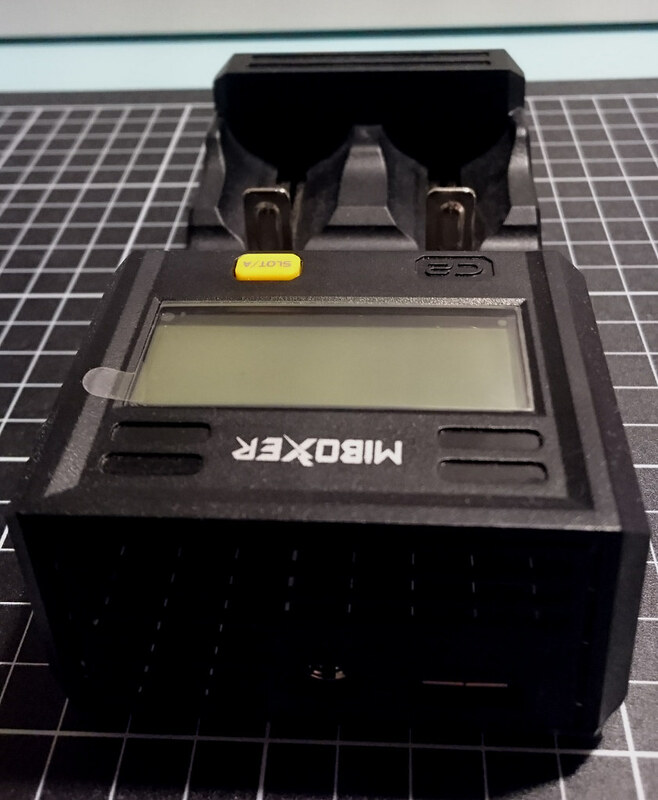 Like on other MiBoxer chargers there is a huge gap between both slots making these chargers perfect for the largest cells you have. There is a USB port on the top of the C2-6000 because it can be used as a power bank for charging external devices. Also the C2-6000 only has one button to control all function. You can only change one setting and that is the charge current no point of a million buttons. You can also change slot readouts. The UI on the C2-6000 is super easy to use. You only have one button to control all function and there is only one function and that is current select. So you simply push the slot button to change slots and push and the slot button to change output currents. Between the different slots. Well I guess two options for button. Its basically the same setup as the C2-4000 here. You have almost all the same screen display option except for battery discharge but you gain a separate setup for the USB power bank. The MiBoxer C2-6000 is a performance monster. I think it may be the fastest commercial lithium charger on the market? For standard type cells I am not talking about hobby or custom chargers. The C2-6000 brings unbelievable performance to the table with a whopping charge output of 3amp per slot. That is a 6amp total output between both slots. You could charge a fully drained 26650 in under 2 hours which is amazing! Also while being a total beats the C2-6000 can also charge the smallest cells you own with a charge current of 100ma makes the C2-6000 a great all round charger. Do you own any 10440? 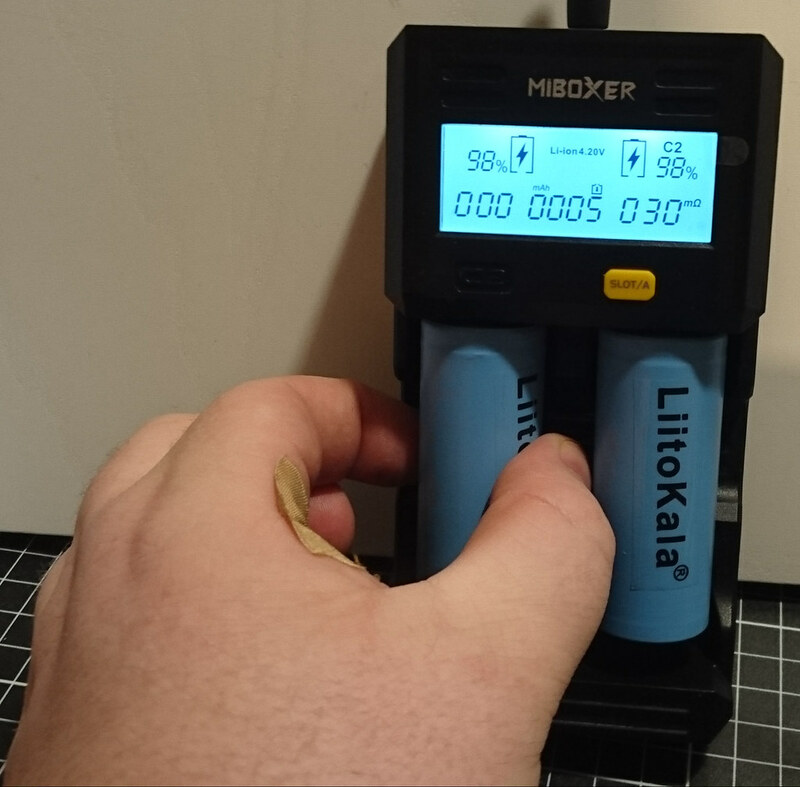 Perfect charger for small to large cells! 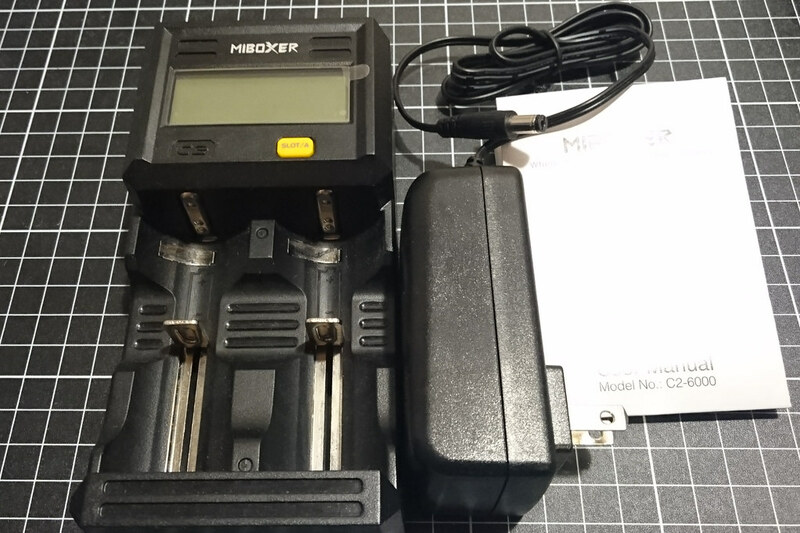 Seeing as the MiBoxer C2-6000 is a fast charger I wish MiBoxer would have included more current options for NiMH cells. A 3amp charging current for D sized NiMH cell would have been really nice! Time is money right? Yes but I can only recommend charging a few cells at the 3000ma current. I will list a few batteries here lets start with the 26650 it will be okay at 3amps. Plus the C2-6000 has an inbuilt temperature monitor helps tell if the cell like the current. High drain 18650s can sustain 3amp charge current but they will heat up and can become dangerous so they should be monitored. If you look at the data sheet for the Samsung 25r they state a max charge current or 4amps (4000ma). Sony VTC5 have a standard charge current of 2.5amps I can find not the max charge rate for the VTC5. So with high drain 18650 you are okay. As I already said never leave charging cells UN-monitored! You also have cells like 20700, 21700 which are a bit more common. Heaps of other cells between the 18650 and 26550 that will be okay with 3amp charge current. I do not own any of the cell in between. Soon enough the 20700 and 21700 will become more common in flashlights. Vapers already use them so its only a matter of time. 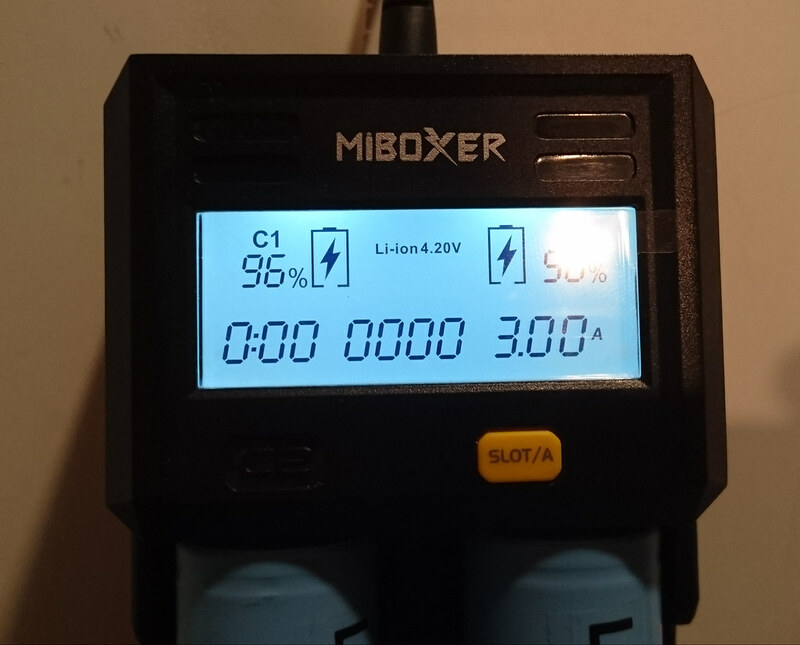 The MiBoxer C2-6000 is not compatible with Lipo 3.6v cells and 4.35v Li-on. It will still charge 4.35v Li-on cells fine it will just end the charge at 4.20v so you will have less capacity. 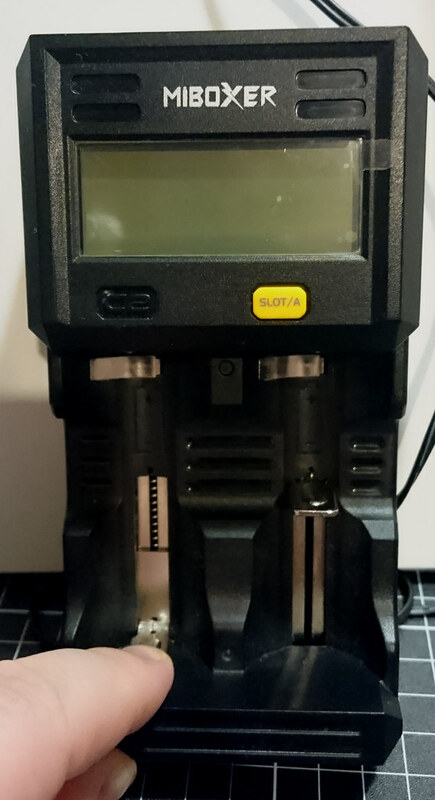 The charger can charge all cells from small to large from 10340 to 26650 and just about all cells in between thanks to the manual current select. It will charge the following cells fine. Remember the C2-6000 can charge your 4.35v cells it will just end charge early like many other standard chargers. Even when using 18650s the USB handles output current and voltage well! The C2-6000 can act as a USB output aka a battery bank when using lithium-ion cells. The C2-6000 can output 5v at 1amp so a fairly standard output but it may come in handy for some. The USB output does have a feature where it drain both cells equally. If the cell in slot one is at 3.5v but the cell in slot two is at 4.20 it will drain slot two down before using any more energy from slot one. You can also manually choose which battery you want drained by pushing the slot button. Similar results to the C2-4000 which makes the C2-6000 perform similar in the automatic charge select. Work well for larger cells but for smaller cells its more optimal if you chose the correct charge current yourself. The temp measurements look good! The charger is measuring the external temp of the cell. You can get similar results using a K type probe from a multimeter I checked mine compared to my multimeter and the temps are correct. 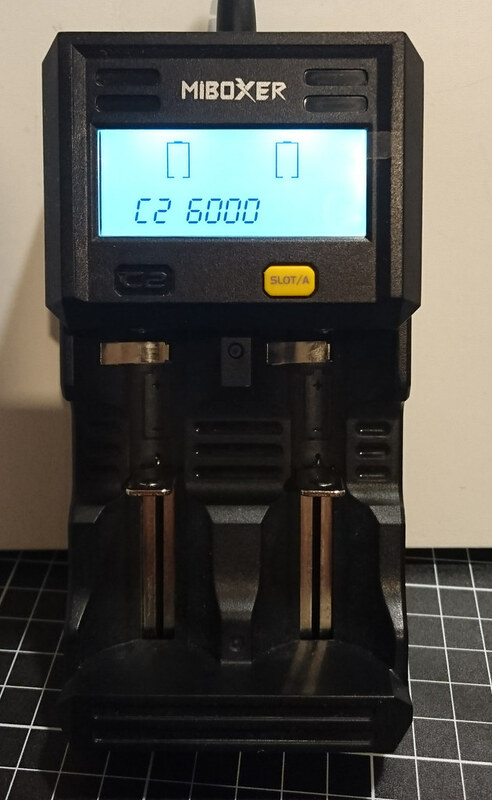 Overall the C2-6000 is one of the best 2 slot chargers on the markets it loses a few features when compared to the C2-4000. It also gains charging capabilities that are twice as much. Which makes this charger perfect for some one who regularly uses large cells in series or parallel. You could still test the capacity of your cell by fully draining in a device then charging them on the C2-6000 seeing as it has a charged milliamp readout. Sorry about the pics i have taken better shots in the past i will try and replace some. Bad lighting where i am! Thanks for the review. Is there an Aussie plug pack available or are we stuck with a crappy adaptor? Hey mate still no Aussie plugs we are the forgotten country lol. I am trying to find the thread i started about this issue maybe it needs a bump. The bottom line on HJK’s review is “Something is good, something not, check the review”, I’ll go with that and skip this one. I just put 4 brand new button top 30Qs from Liion Wholesale in my C2-6000 . All read high IR and low mAh capacity (low 2000s mAh total , original plus added ) when done charging. I thought it was only a problem with protected cells but that apparently is not the case. One cell was extremely high IR ( over 300 m ohm , this after 999 and reinserting multiple times). It did let me override the charge current and it stuck so if I ignore the readings it does charge cells . Just noticed that the first two are not close to 4.2 volts .One is 3.89 and the other 4.06 . That’s weird. I put a 5th 30Q into the LiitoKala 100 . It took about 11/2 hour longer to charge but it came off at 4.21 volts and stayed there. Maybe I should just buy 4 $5 LiitoKala 100s instead of a 4 bay charger. Less BS. Hey mate are the batteries real? Do they have any sign of damage? I think they are good. Came from reputable source. After putting them in the 100 , they are where they should be . The 6000 terminated them too soon . That’s a first for it. 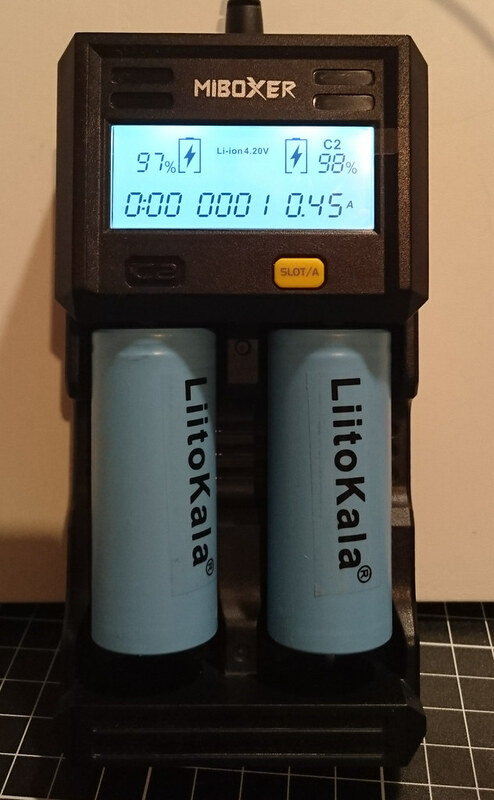 How long did the charging take in the Lii-100? Did you charge them at 1 amp? Did you auto charge on the C2-6000 or manual select? Send MiBoxer a message on here and ask them for a replacement? Almost 4 hours at 1 A. The 6000 took about 2 hours at 1 A . I thought it was quick. Usually it takes forever to finish . I have 2 more cooking as we speak . We will see if it was a fluke or not. Yea, probably time to speak to Miboxer about it. Was it 4 hours per cell? What voltage did you start charging the cell at? 4 hours is also to long? Brand new cells . One was 6% , one 24% and so on. I knew this charger has a hard time with IR readings . Early termination is something new. Usually when it gets to CV stage , it takes a good 1-2 hours more but this time it said 100% in no time. Weird I can’t say for sure the cells should ship at around 50% capacity. Around 3.6 volts. Did you measure the voltage when you got the cells? On brand new cells the cv phase should be quicker less then an hour for sure. The batteries them selves sound a bit funny maybe they where old stock? What cells are they? Are they button tops? 30 Q button tops, these are the initial measurements from the charger. The 5th one I don’t know because it went into the 100 charger . Everytime I receive supposedly brand-new cells that are not around 3.65v (+/-.01v measured in my dmm, not from the charger’s), I am immediately alarmed about its quality. Genuine cell manufacturers have very strict QC on cells that come out of their factory, and takes a very long time in storage before it self-discharges albeit at a very low rate. 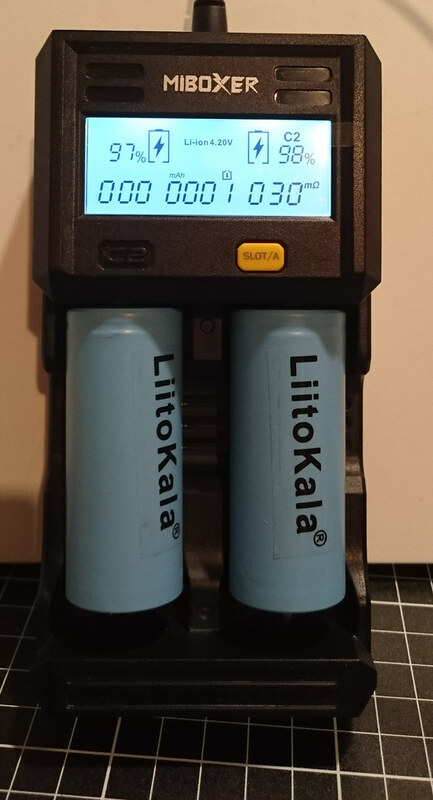 Try testing a primary Energizer Lithium AA/AAA, they always measure 1.800v ! Hmmm they are a bit low but not bad. I would think 3.4v is a tad low for a new cells? I just got a review light from Gearbest they sent a cell inside it came at around 3.7v. Plus you cant always trust the results from a charger when measuring voltage they are usually all over the place. 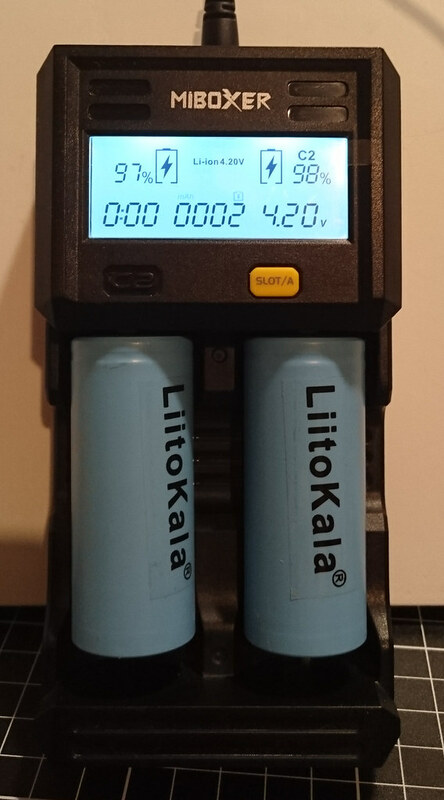 My litokala engineer 500 read 4.20v when the battery is like 4.05v its pretty normal for a charger to do that. I cant say your charger is okay because it could be stuffed but it could also be the button tops playing with the IR readings. Are the buttons welded in place? My issue is the cells do not come from the factory with button tops they are added after by a company. So they could have made a whole bunch and just left them till they sell. Have you tried any other cells in either charger? I only tried protected cells in this charger before now. I always assumed the protection circuit accounted for the high IR readings. Now all the 30Qs read under 100 m ohms since they have been fully charged. I used the 100 to finish charge each one to termination after coming off the 6000 charger. They took considerably longer to complete on the 100. All of Liion Wholesale buttons are welded on by the way. 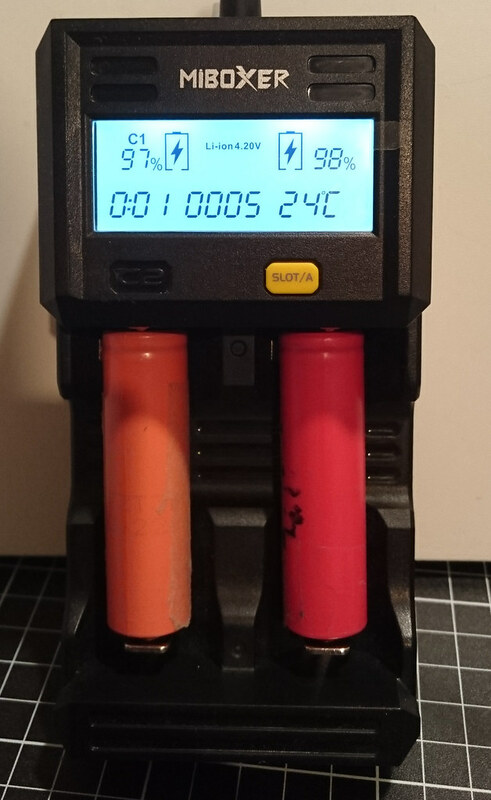 I am going to purchase an analyzing charger to test their capacity because doing the math with mine resulted in extremely low figures for these cells. Yea most of my protected cells measure bad but some worse then others my NCR18650 measure okay high but like 100-250 mohms. Then i have generic Chinese cells with protection that measure bad like 999 mohms lol. Maybe for now just drain these cells down to 3v and charge them up again using the C2-6000 and get the capacity from that? Its not impossible that you got bad cells seeing as there is lots of fakes around maybe the company has bought fakes and no one knows. Its also possible that the charger is broken but i dont think the Liitokala should take that long to finish the cells either. Are the cells losing voltage while resting? After charging what is there initial resting voltage? My hard worn HG2 will charge to 4.21v then after a while rest at 4.15v because they are worn. They are holding . They are probably ok, just need exercise. Thanks. Best to explore all possibilities first. If its a dud charger best to get on it sooner then later and get a new one or a refund. If you want a analysing charger heaps of options now but none with 3amp charging. I am thinking Zanflare C4 . Not a lot of $, decent review . Maybe now that my cells have been charged once, the 6000 will be ok .